Today’s Shoreham Football Club was founded in 1892 playing competitive matches in the West Sussex Football League as from 1896, the Sussex Senior Challenge Cup competition that had been run since 1882 and the Royal Ulster Rifles Charity Cup (originally the Royal Irish Rifles Challenge Cup) a competition that was begun in 1897. 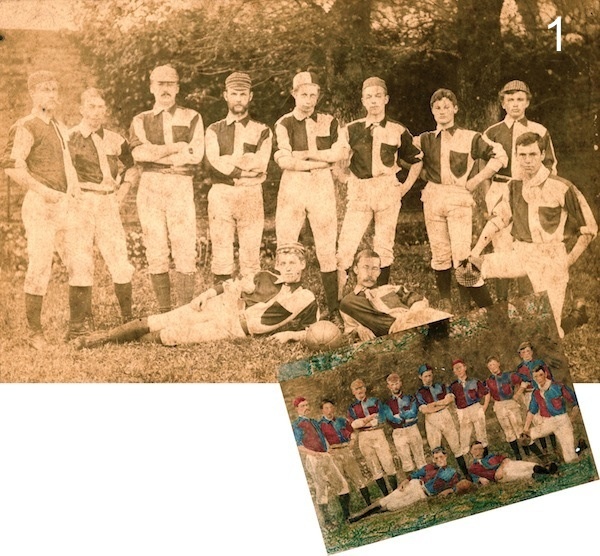 The earliest known photo of a Shoreham football team (1) is dated 1886 and was taken by William Page, the photographer of East Street in Shoreham. It does not identify the players who are wearing trousers, not shorts, neatly tucked into socks, even skull-caps and peaked caps that were commonly worn by footballers then. There is a crudely hand-painted version of this recorded with the same year that shows the shirts with one half blue and the other red. 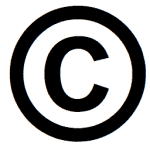 It is unlikely that this is a true reproduction of the original colours as red and blue show as dark grey in black and white images. From the photos taken during this period up to 1903 all we can say is that they appear to be a light and a dark colour – perhaps white and blue. The West Sussex League was formed in June of 1896 and consisted of a Senior and Junior division made up of twenty teams. The clubs in it ranged from Southwick to Chichester in the south up to Petworth and Horsham in the north. In those days the motor car was virtually non-existent and the only regular transport fast enough to make travel on match days viable was the railway. It is pertinent to note that the majority of the founder member clubs were ranged along or near to the coastal railway line and even those inland were close to a railway station. Shoreham F.C. under the name of Shoreham Swifts were one of the original members in the senior division but by the time the season actually started they had become just ‘Shoreham.’ William Ayling of Shoreham was one of the committee members. He ran the grocery store in the High Street and may well have been one of the club’s earlier players. His younger brother Ernest later played in goal for Shoreham and Sussex. Harold Brown, one of Shoreham’s leading notaries, was elected as President of the West Sussex League in 1898 – could he have been the ‘H. Brown’ selected to play for the Sussex F.A. during the 1887/88 season? A cup was purchased by the League for ten guineas to be the senior division cup – it is now insured for £20,000 – a magnificent trophy larger than today’s F.A. Cup. A smaller cup was obtained for the junior division trophy. 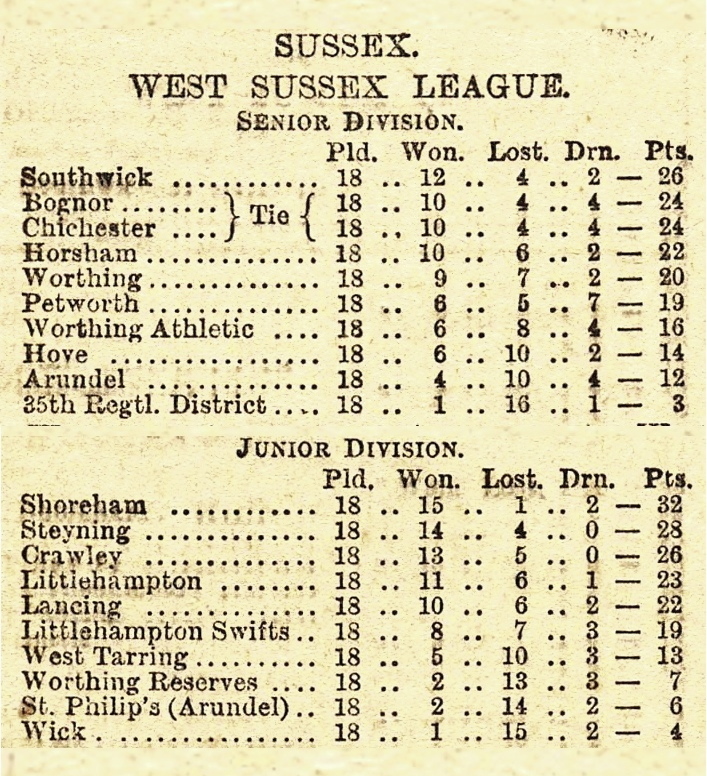 This discouraging form seems to have continued as the next season (1897/88) Shoreham disappeared from the senior division but won the junior division. In other words there must have been a promotion/relegation arrangement in force even then and Shoreham were relegated in their first season. 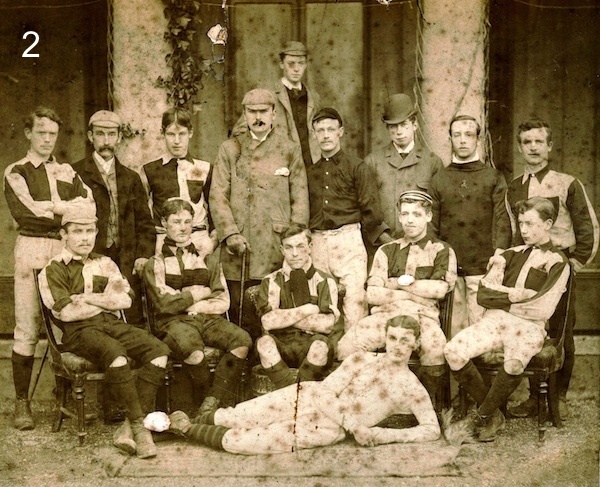 There are no records left to us identifying any of the individuals in the next photo (2) either but from a continuity point of view the player, third from left in 1886 and the man in the coat (probably the manager at the time) standing fourth from the left in the later photo appear to be one and the same as does the man wearing the bowler hat who is the player standing fourth from the right in the earlier image. 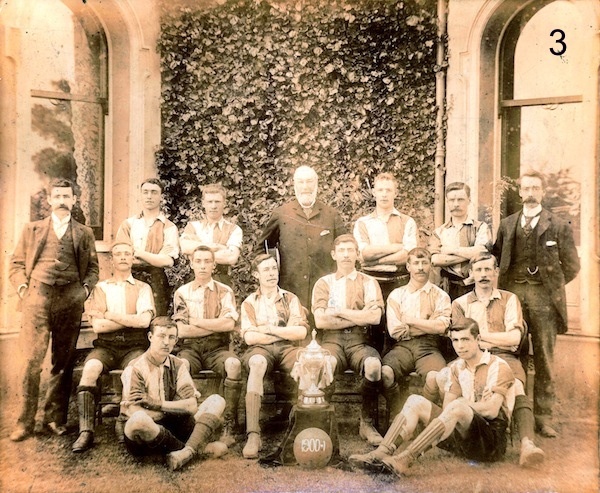 Believed to have been taken during the 1890’s it may record the team at the time of the club’s entry into the West Sussex League or, perhaps, the team that won the junior division in 1898 (despite the lack of a trophy in the picture). The boy at the rear is very similar to Ernest Digby Gates who some years later captained the side. His father Thomas Gates was a ship owner and lived at Athol House in New Road and this photo may have been taken there. The next oldest image (3) does list the players. It is of Shoreham FC Reserves, winners of the West Sussex Junior Division (and therefore the Junior Division Cup) 1900-01 taken at the front of Ravenscroft House (it stood on the eastern corner of Raven’s Road and Mill Lane) home of Richard Barnett Dell, a wealthy Shoreham auctioneer and president of the club. Standing left to right: William Winton linesman, C. Cheesman, H. Dell, R. B. Dell (President), J. Savage, F. Cheesman, Oswald Ball recorded as secretary at the time of this photo but known to have been first team manager in subsequent years; centre row sitting left-to-right: C. Atherfold, W. Slaughter, G. Gates, C. Upton captain, W.J. Ellmer, M. Cook; front left J. Bacon, right J. E. Hackett vice-captain. A number of these players appear in later photographs having progressed to the first team. Later that year the first team were involved in something of an historic ‘first.’ Brighton & Hove Albion who had only just been formed during June of 1901 played their very first game, a friendly, against Shoreham on the 9th September 1901 at the Albion’s training ground in Dyke Road (they played their subsequent Southern League games at the Sussex County Ground but moved to the Goldstone Ground the following season). Even as a friendly it nevertheless attracted a large crowd and the attention of the Sussex Daily News. Shoreham won the toss the game kicked off at a quarter to four and to begin with play was fairly even. Shoreham’s team were:- E. C. Ayling, goal; G. Gates and E. Collins, backs; M. Blaber, C. Griggs, and A. Upton, half-backs; F. Longstaff and W. Ellmer (right wing), F. Rose (centre), E. D. Gates and C. Peak (left wing), forwards. Despite giving a good account of themselves in that match Shoreham were to make history yet again against Brighton but for less impressive reasons. In an FA Cup match on the 14th October 1902 Shoreham were on the wrong end of the Albion’s biggest-ever win losing 14 – 2 to them at the Goldstone! 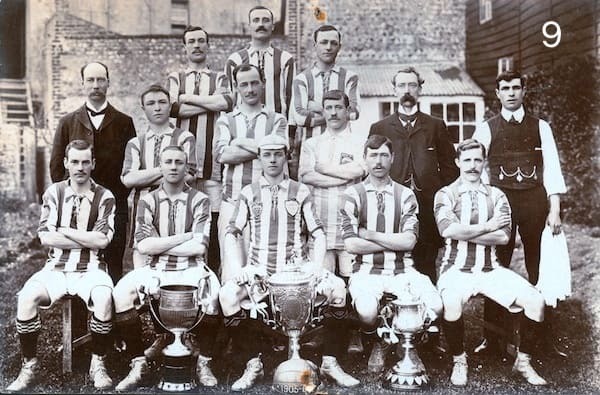 Shoreham’s record of historic matches involving Brighton and the Goldstone Ground were though, redeemed by another historic first that is described later. The club’s first major success was during the1901/2 season when the first team won the Sussex Senior Challenge Cup beating Hailsham 3 – 0 but no team photos appear to have survived that include the trophy that year. From the identifiable players in this image (4) the year has to be similar, probably a little later, to the previous photo. The back row shows, left to right, Oswald Ball, George Gates, C. Atherfold, F.Cheesman, and possibly J. Savage. In the row of seated players the second from the left (unidentified) is wearing a West Sussex badge and W. Ellmer is second from the right. The players on the ground are William Winton and right is J.E.Hackett. The inclusion of a player of county standard perhaps suggests this could be the first team but comparing the players here with the 1900/01 photo it is more likely to be the reserves, particularly as Oswald Ball is included as the manager before he took over the first team. In 1902/3 the first team won the senior division for the first time in their history (and therefore the Chichester Cup which was the West Sussex League’s trophy for the senior division winners) and the Royal Irish Rifles Challenge Cup (renamed the Royal Ulster Rifles Charity Cup in 1922) when they beat Hastings and St.Leonards 4 – 3 at the Oxen Field in Shoreham. That same season the second team (recorded as Shoreham II rather than Shoreham Reserves) won the junior division. In this 1903 photo (5) few players are recognisable and despite the caption for this image in the Marlipins Collection saying Oswald Ball is wearing the bowler hat– it isn’t him. In the back row Henry Upton is third from the left and E.C.Ayling is third from the right. Wallace Slaughter is the third player from the right in the second row. The cup however is not the cup won by the reserves in 1900/01 (3) and is something of a mystery. Perhaps it may be the original Senior Division Cup before it was replaced by the more impressive trophy seen in the 1906 photo (10). Another strange point is that one of the shirts has the colours in reverse. Records for the Royal Ulster Rifles cup state that Shoreham also won that trophy in 1903 but no photo exists of the team with that cup for that year. 1904/5 was in truth a noteworthy season when the first team won the senior division again as it was in terms of progress through the various competitions. It was heart-breakingly short of complete success though. Having made it through to the finals in two competitions the club were beaten 3 – 0 in the final of the Sussex Senior Challenge Cup by Eastbourne Old Town at the County Ground, Hove, and endured a frustratingly close finish losing 3 – 2 in extra time to Newhaven at the Central Ground, Hastings in the final of the Royal Irish Rifles Cup. 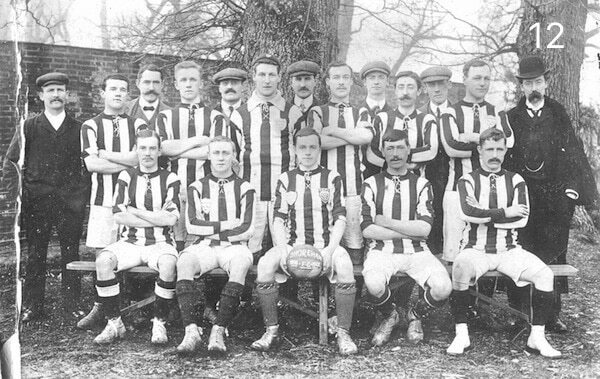 The team for the 1904/5 season are shown in photo (6) and the club has now adopted vertical stripe patterned shirts. The team is named in order of the positions they played in:-: E. C. Ayling, goal; G. Gates, F. Rose, backs; H. Ellmer, Alf Maple, Art (Arthur) Maple, half-backs; F. Longstaff, A. E. Longstaff, H. Upton, E. D. Gates, C. Peak, forwards. The order of the players and officials in the photo however are left to right:- standing J.W. Brooker, Oswald Ball. Middle row Alf Maple, G. Gates, Art Maple, E.C. Ayling, E.D. Gates (captain), F. Longstaff, F. Rose. Front H. Upton, Albert (Bert) E. Longstaff, H. Ellmer and C. Peak. 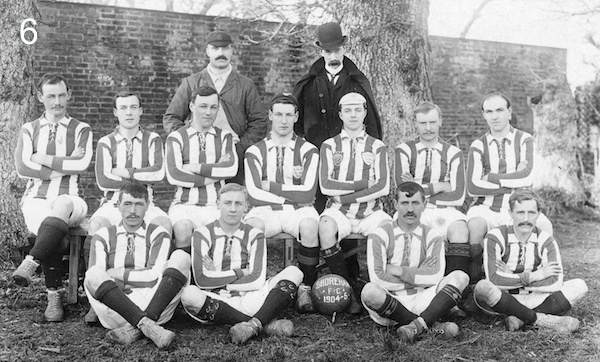 Selected players were awarded badges and caps (hence the term ‘capped for your country or county’ etc.,). These caps were only worn for formal photos (excepting the 1886 photo when caps were worn as part of the kit). Some players sport a badge showing six martlets on a dark coloured shield above which is marked ‘W.S.F.L’ clearly denoting the West Sussex League and still used as the league’s badge today. Others wear a badge that shows six dark martlets on a light shield background and this was the Sussex Football Association’s emblem. Some players wear both badges indicating selection for both organisations – perhaps the different coloured caps worn by Ayling and Gates suggest that one is for the League and the other for the Association. From 1904 to 1907 the players with these badges are Ernest Ayling – Sussex FA; William Ellmer – West Sussex League; Digby Gates – Sussex FA and West Sussex League; Albert Longstaff – Sussex FA; Art Maple – Sussex FA. The unidentified player second from left, middle row of photo 4 may be wearing a West Sussex badge. By now the club was something of a force in the county and townsfolk would flock to the Oxen Field when home games were being played. The team’s nickname was ‘the musselmen’ (A) and many Shoreham supporters would carry black umbrellas with strings of mussel shells hanging from them. Photo (7) shows the Oxen Field from St.Mary’s church tower. This is the area in the middle distance seen covered by soldiers and tents in 1914. The field extended from Buckingham Road on the east through to and including Windlesham Gardens on the west, and from Mill Lane on the south almost up to Windlesham Road to the north. Known as Shoreham Park and Sports Ground it was used generally by the town as a recreation ground until the purchase by the council of Buckingham Park in 1931. An earlier photo (8) of the field shows the cricket pavilion in the background and practice nets to the left. A 1907 carnival sports picture of the field (9) looking south with the Mill Lane windmill in the distance – this area is now covered by Windlesham Gardens. By now the club was something of a force in the county and townsfolk would flock to the Oxen Field when home games were being played. The team’s nickname was ‘the musselmen’ (A) and many Shoreham supporters would carry black umbrellas with strings of mussel shells hanging from them. Photo (7) shows the Oxen Field from St.Mary’s church tower. This is the area in the middle distance seen covered by soldiers and tents in 1914. The field extended from Buckingham Road on the east through to and including Windlesham Gardens on the west, and from Mill Lane on the south almost up to Windlesham Road to the north. Known as Shoreham Park and Sports Ground it was used generally by the town as a recreation ground until the purchase by the council of Buckingham Park in 1931. A 1907 carnival sports picture of the field (9) looking south with the Mill Lane windmill in the distance – this area is now covered by Windlesham Gardens. Sad to say that crowd trouble in those days was just as bad as it is now, at least as far as the local derby matches between Shoreham and their neighbours Southwick were concerned. During the 1890’s when playing at home to Southwick some Shoreham supporters would gather at the station until the opposing supporters arrived then fight with them all the way to the Oxen Field ground. After the match the fight was resumed on the return trip to the station. During one local derby match after Shoreham had scored the linesman was knocked out for flagging the goal as offside! 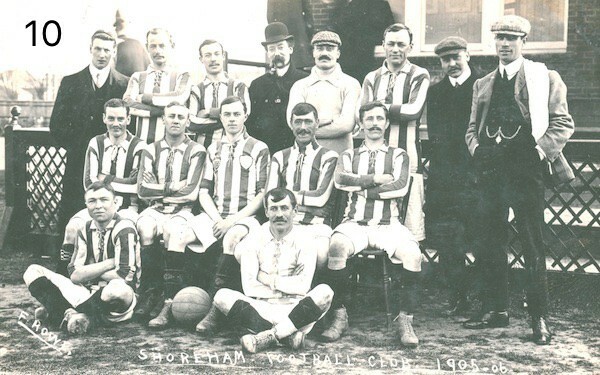 The successes of season1905/6 without doubt culminated in Shoreham’s finest hour. The first team won the senior division, the Sussex Senior Challenge Cup beating Hove 2 – 1 (when the final was played for the first time at the Goldstone Ground and thus completed Shoreham’s three historic ‘firsts’ associated with Brighton & Hove Albion and the Goldstone), and the Royal Irish Rifles Challenge Cup when they beat Newhaven 2 – 0. The ‘Treble’ portrait taken of the 1905-06 team (9), winners of the three trophies shown in the foreground left-to-right: Royal Irish Rifles Challenge Cup, West Sussex Senior League Cup and the Sussex Senior Cup. Back row left to right – Ernest C.Ayling 27, worked as an estate agent – his brother ran the well known grocery and drapers business at 54/56 High Street. He appears in other years team photos and seems to have alternated with W.J.Brooker as the team goalkeeper; half back Alf Maple 29, brother of Arthur (see below) who’s father was oyster merchant Sam Maple – both were fishermen and assisted in the running of the family’s fish shop business in the High Street; full back George A. Gates 24, carpenter and son of William Gates who ran the successful builders and undertakers business in Brunswick Road; Secretary and Manager Oswald Ball 35, headmaster of Ham Road School and later the Victoria Road school; John Wallace Brooker 33, alternated the goalkeeping position with Ernest Ayling in this photo and perhaps also acted as trainer before James Hackett (below) took over that role. Brooker had a painting and decorating business – his paint shop was on the Dolphin Hard next to the ferry crossing; full back Art (Arthur) Maple 26, fisherman and brother of Alf (above). In 1908 he married Ivy, one of the daughters of William E. Winton who organised the town’s regattas and carnivals; Unknown; James Edward Hackett 25 the trainer – he was a well known athlete in his own right, the Sussex Half Mile Champion in 1913 and went on to become a gifted amateur dramatic actor who starred in shows at the Theatre Royal, Hippodrome and West Pier in Brighton as well as in Shoreham’s numerous amateur productions during the twenties and thirties. Middle Row – (all forwards) Wallace Slaughter 22, the son of Edwin who ran the greengrocery shop in the High Street; Albert Edward Longstaff 21 who two years later signed professional terms with Brighton & Hove Albion to become one of their most successful and popular players (B); Ernest Digby Gates 26 (captain) generally known as Digby. In his position at inside left he was one of the club’s most prolific goal scorers and was selected to represent the Sussex Football Association and the West Sussex Football League in their matches. He also made his mark in local cricketing circles where he was known as ‘a free hitting batsman.’ He went on to build an extensive legal practice, made his name with his ‘genial presence’ in the Sussex Courts, was appointed solicitor to the Shoreham Urban Council and Deputy Steward of the Manor of New Shoreham (i.e., he acted on behalf of the Duke of Norfolk). He was not to enjoy a long life however and in 1933 died at the age of 53 at the Gates’ family home at ‘Blair Atholl’ in Southdown Road; Harry Upton 22, one of the well known and prolific Shoreham family of that name that lived in and around Surrey Street; Charles Edward Peak 26, a fruit grower who owned the Southdown Nursery in Southdown Road and like Digby Gates became a prominent member of the town council. The Gates window display (11) showing the R.U.R Cup on the left, the West Sussex Senior League and Sussex Senior cups on the right. 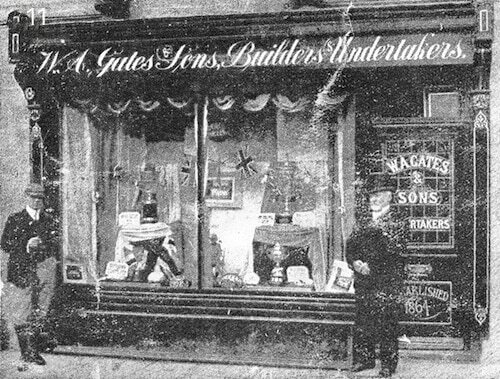 It is probably George Gates with his father standing outside the shop at 40 Brunswick Road – the firm also had their store at what is now Marlipins Museum in the High Street. Finally a photo of the team at the end of the 1906/7 season (12). No record can be found of any honours won at the time but it is the last image of Shoreham F.C. we have for the period (the next is not until the 1950’s) and so concludes this article. Three of the players from the previous season are missing (Alf Maple, Frank Stubbings and William Elmer) and their replacements have not been identified. The recognizable individuals are:- back row fifth from left J.W. Brooker, 6th E.C. Ayling, 8th G.A. Gates, 12th Arthur Maple, 14th Oswald Ball. Front row from the left W.Slaughter, Albert E. Longstaff, E.D. Gates, Henry Upton, C.E. Peak. Art Maple and Bert Longstaff are now also sporting Sussex F.A. badges. (A) See the article ‘The Origin of the Southwick Cat and Shoreham Musselmen’ (on the Shorehambysea.com website, at Shoreham and Worthing Libraries and at West Sussex Record Office) for more information. 1902/3 West Sussex Senior Division, Sussex Royal Irish Rifles Challenge Cup, West Sussex Junior Division champions. Ernest Ayling – Sussex F.A. ; William Ellmer – West Sussex League; Digby Gates – Sussex F.A. and West Sussex League; Albert Longstaff – Sussex F.A. ; Art Maple – Sussex F.A. 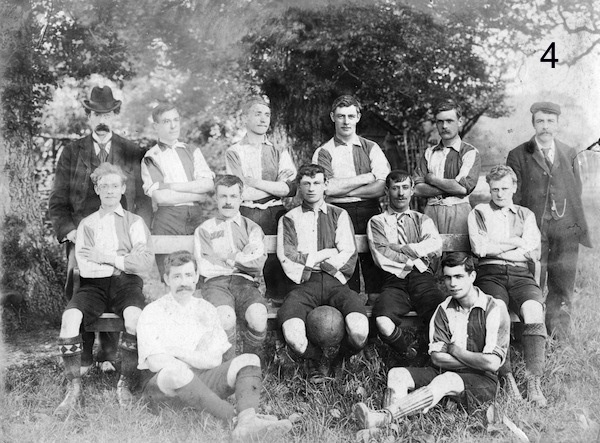 One unidentified player second from left, middle row of circa 1904 photo – West Sussex League and, possibly, Harold Brown – Sussex F.A. ‘Bert Longstaff – Shoreham’s First Professional Footballer’ article pages 2 & 3 on the Shorehambysea.com website and in Shoreham/Worthing Libraries. Alan Upton’s ‘Bygones’ article from the Shoreham Herald 20th July 2000. Image numbers of photos from the Marlipins Museum Collection (1) 89.723 & 89.724, (2) 94.2458, (3) 2002.3251, (5) 2002.3254, (6) 96.2872, (8) 89.1128, (10) 89.706, (11) 89.707. Image numbers of photos from the Winton Collection (4) W9gna, (9) W5b, (12) W9et, (13) W9gr. Image numbers of photos from the Doris Steers Collection (7) dks8b. 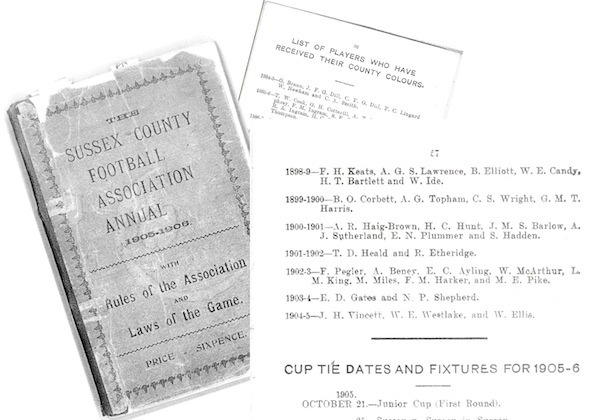 Images of the 1905/6 Annual kindly provided by the Sussex Football Association. NB. It has not been possible to search all the newspaper archives of the period held by West Sussex Library Services and West Sussex Records Office that may provide more information.